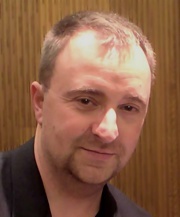 Richard Harris has worked as a composer, arranger, performer and music teacher since 1990, having graduated from Edinburgh University in that year with a first class honours degree in music. From 1989 to 2002 he was a member of the internationally acclaimed six-piano ensemble Piano Circus, with whom he performed concerts all over the world. His compositions for the ensemble feature on the Decca CD ‘Loopholes’ and in full on the group’s most recent CD ‘Landscapes of the Heart’. He also arranged several works for the group to much acclaim with his adaptation of Heiner Goebbels’ ‘Scutigeras’ described as both ‘masterful’ and ‘brilliant’ by BBC Radio 3 on its live broadcast. Richard Harris performs in a duo called The Director’s Cut which specializes in playing classic film and television themes, and in the jazz duo Mood Indigo with singer Karina Fernandez. He also teaches piano, music theory, GCSE and A-level to many private pupils and to pupils at Cardinal Vaughan Memorial School and Westminster School.